How to Play Club Penguin in Full Screen! Hey there everyone! How many of you would like to play Club Penguin in full screen on a small screen laptop/computer? 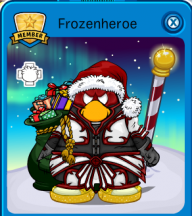 Many people don’t get to enjoy the full screen version of Club Penguin and have to always scroll up and down to select things in the game, since their screens don’t show the full picture in the browser. I’ll show you how to do it on two popular browsers: Continue Reading!